This booklet chronicles the contributions of women nurses throughout the development of the Army Nurse Corps. Their story begins during the American Revolution when General George Washington asked Congress for nurses “to attend the sick.” In the decades that followed, whenever the military establishment expanded or contracted, medical services followed suit. The Spanish-American War was a turning point for military nurses. Although not commissioned as a regular part of the Army, more than 1,500 female civilian nurses volunteered to care for the wounded. Shortly thereafter, in 1901, the female Nurse Corps became permanent under the Army Reorganization Act. 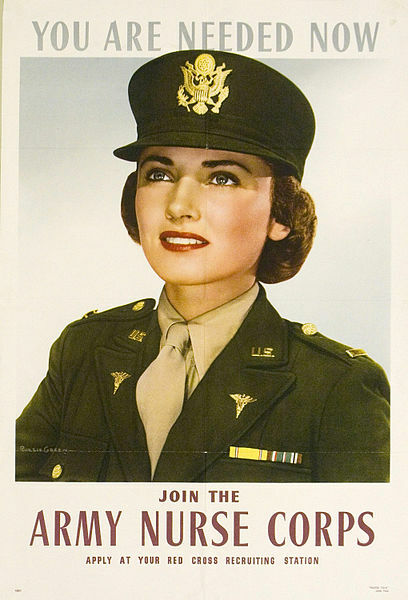 Poster encouraging women to join the U.S. Army Nurse Corps during World War II. Interested citizens could apply at Red Cross recruiting stations. If there ever was a time when the Army Nurse Corps was an indispensable part of the American military establishment, it was during WWII. Several pages of the book are devoted to this period. At one point the number of active duty nurses swelled to 57,000. Sixty-six were captured and imprisoned by the Japanese in the Philippines. Many landed in North Africa on the day of 1942 invasion. Others arrived just days after the 1944 Normandy beach landing. Tragically, by the war’s end, 215 Army nurses died while serving. Be it on base battlefield hospitals in WWII France, in MASH units on the front lines of the Korean War, or among a 6,000 strong crew during Vietnam, Army nurses helped to save tens of thousands of lives. Numbers may have waned in peacetime but standards in training and care never did. 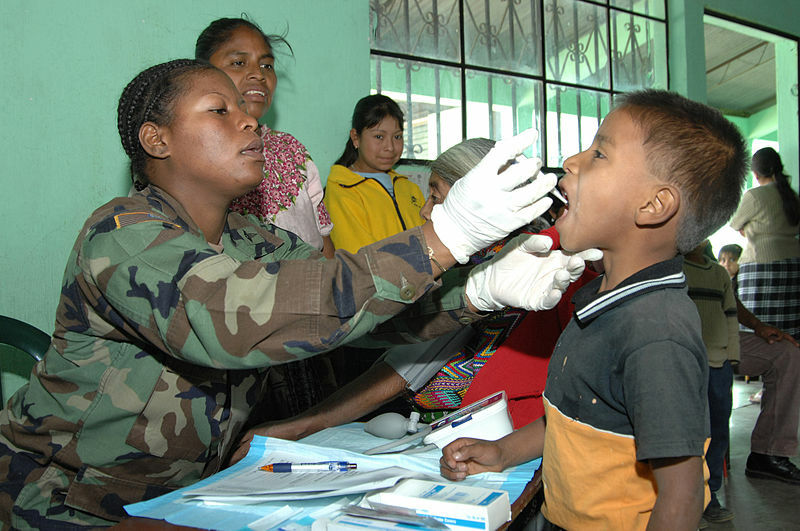 U.S. Army Nurse 1st Lt. Arnelle Lewis takes a Guatemalan boy’s temperature during a medical readiness training exercise in Santa Cruz Balanya, Guatemala, on March 10, 2007. Lewis is a registered nurse attached to the U.S. Virgin Islands Army National Guard. This entry was posted on Wednesday, October 12th, 2016 at 4:19 pm and is filed under Center of Military History, Department of Defense, Military History, U.S. Army. You can follow any responses to this entry through the RSS 2.0 feed. You can leave a response, or trackback from your own site.